NEWPORT, Ky. -- Ryan Poston was going to break up with Shayna Hubers, three of his friends testified Thursday. Prosecutors have said it was that jilting that motivated Hubers to shoot and kill Poston on Oct. 12, 2012. They said she went to Poston's Highland Heights condominium that night to either keep him as a boyfriend or put him in a body bag. Just days before his death, Poston confided in two friends that things were going so well in his new law practice that he had to move on. 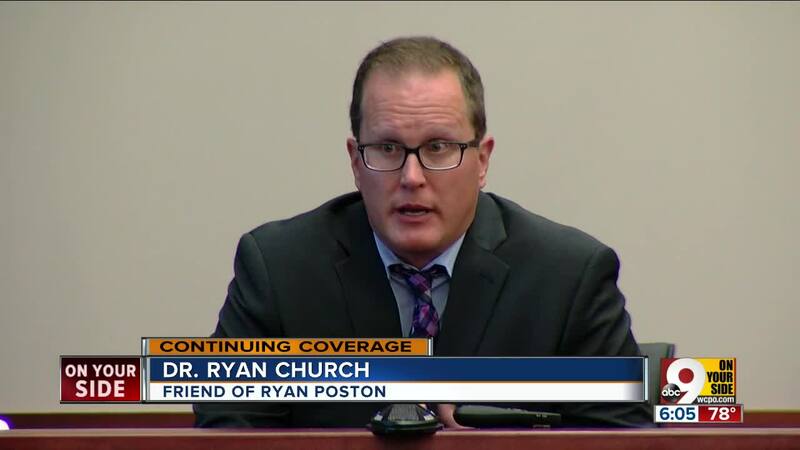 "He had said he was trying to end the relationship, that he didn't want to date her anymore, but just couldn't seem to get away from it," said Ryan Church, a friend of Poston. Church said Hubers "continued to call him and show up at his house and just wouldn't leave him alone." Poston's friend Adam Bleile also said "he was absolutely going to break up with her." "This time, what was going to be different was, he's breaking up with her face-to-face," Bleile said. "He's going to make it clear, he's going to get a backbone with it, and stand firm on it, because the other ways he did it didn't seem to work." Candice Richter, a receptionist at the law firm where Poston worked, recalled him asking two weeks before his death, how do you break up with someone who doesn't want to break up with you? Hubers was previously convicted of murder for shooting Poston, but the conviction was thrown out after a judge learned one of the jurors failed to disclose a felony. She is being retried for the crime. The shots that killed Ryan Poston were fired from up close, according to a police ballistics expert. Lawrence Pilcher from the Kentucky State Police crime lab was the first witness to testify on the third day of Shayna Hubers' retrial. Pilcher identified six bullet fragments submitted to him as being fired from the gun used to shoot Poston. He also examined Poston's shirt to determine how far away the muzzle of the gun was when the shots were fired. Pilcher concluded that none of them was a contact wound, but said they were delivered from between 6 and 30 inches away. That fits with the version of events presented by forensic pathologist Dr. Gregory Wanger, who testified Wednesday. He performed the autopsy on Poston and said that some of the shots had been fired from within 2 feet, based on the gunpowder residue. Prosecutors have said Hubers began firing from across a kitchen table, then moved around the table to deliver the final shots. Melissa Brown, a forensic science specialist with the Kentucky State Police, said DNA matching Poston was found in the kitchen table, where he had been sitting when he was shot. During her testimony Thursday, Brown described the four-step process: cleaning the DNA, determining how much is available, making copies and getting a profile. There wasn't enough DNA on the grip or trigger of the gun used to kill Poston to develop a profile, according to Brown. 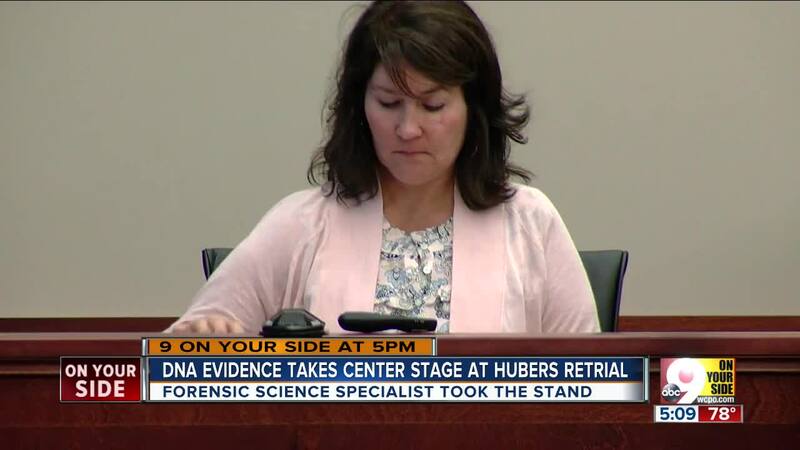 But she found the DNA of both Hubers and Poston on the shirt he was wearing. Hubers admitted to police that she shot Poston, but said it was in self-defense. The trial will continue Friday.